Have you ever heard of the term “Mozart Effect”? It is a popular theory that “listening to Mozart makes babies smarter”. Although much research has gone into studying the benefits of brain development when playing Mozart music for babies, study results have been conflicting and controversial. While some researchers found it to be real, other dismissed it and argued that even if it has benefits, they are short-term benefits only and have no effects on long-term brain development. Despite the unproven benefits, I, like many mommies-to-be, spent countless nights during my last pregnancy playing Mozart to my baby bump. Determined to give my baby the best start possible, I also played Bach, Beethoven, Pachelbel, Tchaikovsky, Liszt… and many more classical composers. In my spare moments, I even talked and sang to my unborn baby, hoping to do some pre-birth bonding. Recently, I found out that my effort has not gone to waste! In a research from the Institut Marquès where they studied the relationship between unborn babies and exposure to music, results showed that babies-in-womb do respond to music by moving their mouth and sticking out their tongue, as if they are singing along, demonstration increased brain activities. The study exposed 300 fetuses 18 to 38 weeks’ gestation to 15 different songs in 3 music genres: classical, traditional, and pop-rock, and also to 2 types of voices: human and Mickey Mouse. The fetuses were monitored via ultrasound scans to capture their reactions. The results were stunning! More surprisingly, the study also found that the type of classical music played does indeed make a difference. Amongst the different classical composers (Mozart, Bach, Prokofiev, Strauss, and Beethoven), babies seem to like Mozart the best. With a high score of 91% of babies responded with mouth movements and 73% with tongue protrusion, Mozart has secured the top place for best classical music to play to unborn babies. And for those of you who love to talk and sing to your baby bump like me, the study found out that babies actually don’t like human voice as much as you think. Looking at mouth movements, only 76% of the fetuses responded to Mickey Mouse voice, while 60% responded to human voice (both lower than the 84% scored by classical music). And if we look at tongue protrusion, the result is even more surprising. Only 17% of the fetuses stuck out their tongue when Mickey Mouse voice was played, and none of them responded to the human voice. So yes, it’s confirmed, the Mozart Effect is real! Babies love Mozart, and the study lead by Institut Marquès demonstrates the importance of early neurological stimulation, which can activate brain areas related to language and communication. 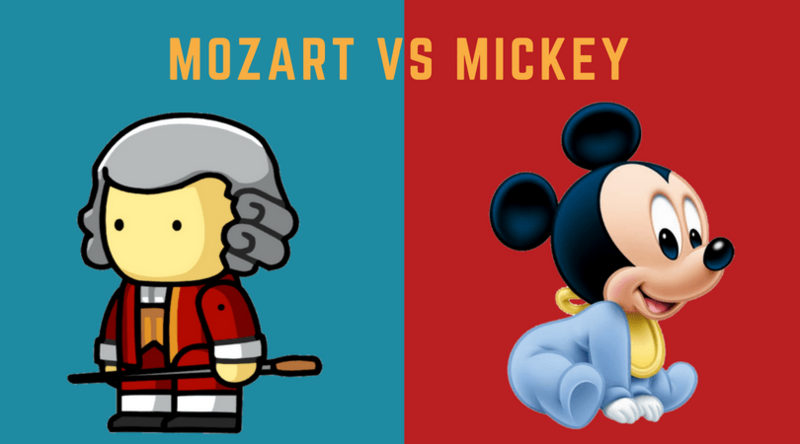 To be honest, I was kind of saddened by the fact that my unborn baby probably loves Mozart and Mickey Mouse more than my voice. However, as stated by Dr. López-Teijón, the director of Institut Marquès, “Music is a form of ancestral communication between humans, the communication through sounds, gestures and dances preceded the spoken language.”, the importance of playing music, especially classical music, to an unborn baby cannot be ignored.